These are the individual products included in the Work Center Kit. (1) D-MCH - Message Clip - Create space saving storage on the wall and off your worksurface. Put your frequently used office tools where they're easy to find and quick to retrieve. 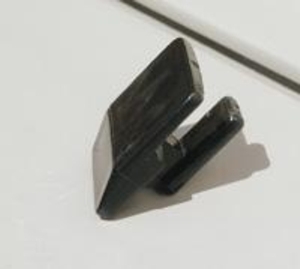 (1) D-ST - Small Tray - (11"w x 3"d x 1"h). Create space saving storage on the wall and off your work surface. Put your frequently used office items where they're easy to find and quick to get. H-H4 - Four inch Hooks: (6 Pieces) 1"w x 4"d. Hang small items off the floor, above your workbench, or anywhere you want them. Keep items easy to find. 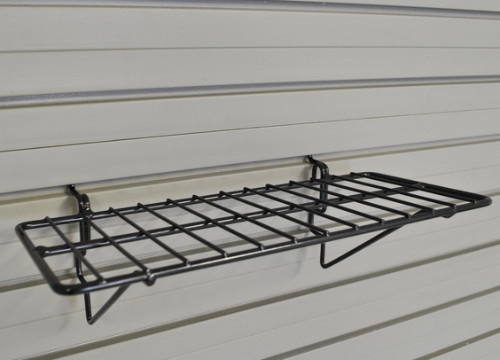 (1) S-S14 - Universal Wire Shelf 14"w x 6"d - Keep small items organized and easy to find. (1) W-MTH2 - Magnetic Tool Holder-24" (24"w x 1"d x 1"h). A great way to keep tools neat, organized and easy to find. Strong magnets will hold all your metal tools, including sledge hammers. (this is the larger unit shown an the bottom of the picture). (1) W-PTH - Paper Towel Holder (12"w x 4"d x 2"h). Keep paper towels close at hand where you need them. Perfect for above a workbench or next to the car cleaning area. Actual product delivered may vary slightly from one pictured. (1) W-TB6 - Tip Out Bins - 6 (24"w x 4"d x 5"h). Ideal storage for small items. Organize nails, screws, clamps, fuses, tapes and more. Easily remove each bin to restock or take it with you to your project. Item color, etc may vary slightly from that shown above. (1) W-TR24 - Tool Rack - Resin (24"w x 6"d x 2"h). Keep all your favorite tools organized and easy to find whenever you need them. Place it above your workbench to keep your work area less cluttered. (1) W-TW - Wrench Organizer-16 (7"w x 1"d x 12"h). A great way to keep wrenches and tools neat, organized and easy to find. The space saving design allows convenient wall storage. Stop searching in drawers for the missing open-end wrench.